Small banks say lending to small firms will be hurt if the FDIC's transaction account guarantee program ends this year. NEW YORK (CNNMoney) -- Small business lending could take a major hit if a federal program that insures small business accounts ends later this year. The program, run by the Federal Deposit Insurance Corporation, provides unlimited insurance for $1.4 trillion in noninterest-bearing transaction accounts, the kind small firms generally use to do payroll. Started in 2008 while the financial crisis was in full swing, the program was created to encourage small business owners to keep their deposits at community banks. But with the program set to expire at the end of December, community banks fear small companies will shift billions of dollars in deposits to the nation's largest banks. Larger banks are viewed as safer institutions because of their size. If small banks lose their deposits, it could stifle or kill their capacity to lend to small firms, which need financing to expand and hire. Ronald Paul, CEO of EagleBank (EGBN) in Bethesda, Md., said his bank could lose as much as $500 million in deposits if small business owners lose the insurance on their accounts. And if that happens, "that would put us at a zero ability to make new loans," said Paul. EagleBank, which has assets just shy of $3 billion, would be unable to make loans like the $400,000 one it made recently to a nearby restaurant, Paul explained. That financing allowed the eatery to create 61 jobs, of which 21 went to people who were unemployed. The bank lent $101 million to small firms last year, said Paul. The loss of small business deposits "has the real potential to slow down the economic recovery, and more importantly, jobs," Paul said. 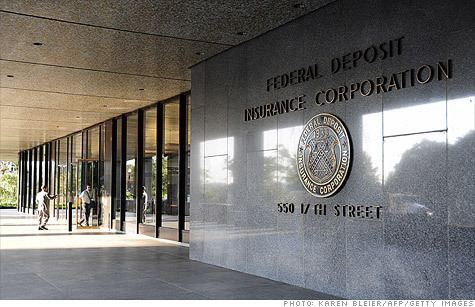 Bill Isaac, who led the FDIC during the 1980s banking crisis, agreed. Doing away with the insurance now would reroute funds to large banks, hurt small business and impede job growth, he said. The Independent Community Bankers of America, a trade group, is lobbying Congress to extend the transaction account guarantee program, arguing the economy isn't yet healthy enough to eliminate it. "It's a huge public policy question that should be resolved before we even get close to Dec. 31," said Paul Merski, the banking group's chief economist. Small business owners are largely unaware of the upcoming deadline, and those that do know are uneasy. Azim Saju and his brother, Navroz, own and operate seven hotels in Florida and already know what it's like to suffer through a bank failure. When one lender was taken over by the FDIC in 2009, their business checking account was frozen for two days, which left them scrambling for cash. The brothers still keep checking accounts for four of their hotels in local banks, only because loan covenants require them to do so. But if the FDIC program expires, they would consider moving their money to larger banks, said Navroz. During the financial crisis, as community banks began failing by the dozen, the amount of money in all accounts insured by the FDIC was raised from $100,000 to $250,000. However, noninterest-bearing accounts used for payroll typically contain much more than that, so the FDIC approved a temporary program to provide unlimited insurance for those deposits. The thinking was that small businesses would keep their payroll accounts at local banks if they felt all of it remained safe. In 2010, Congress extended the unlimited coverage another two years with the Dodd-Frank law. The agency is now operating on the assumption the program's life is over, according to an FDIC official, and insurance will be limited to $250,000 for those accounts. Only 3% of the $1.4 trillion that the program insures is at community banks with less than $1 billion in assets. But that's still $46 billion that might end up moving to the nation's largest banks. Big banks don't offer insurance either, but the public perception is that they are too big to fail, so it isn't as necessary. A huge shift of deposits out of community banks would come at a time when they have stepped up lending to small firms as behemoth banks pulled back, according to the Federal Reserve Bank of Boston. Howie Jung, chairman of Paragon Commercial Bank in Raleigh, N.C., thinks he'll lose up to 5% of his deposits but not enough to stifle his lending to small firms. "I think it'll cause some problems, but nothing catastrophic," Jung said. Others have a darker view. Losing those deposits would drive up the cost of lending, said Bill Schenck III, president of Tristate Capital Bank in Pittsburgh, Pa. It might also force them to raise their credit standards. "We will still be working hard to make loans to small businesses. But it will make our cost of doing business for small business more expensive," Schenck said.